Our team's first exposure to positive curvature in six years of snow sculpting went quite well. The many bumps, dips, and right angles were a little intimidating, but we managed to complete our mission after five days of hard work. 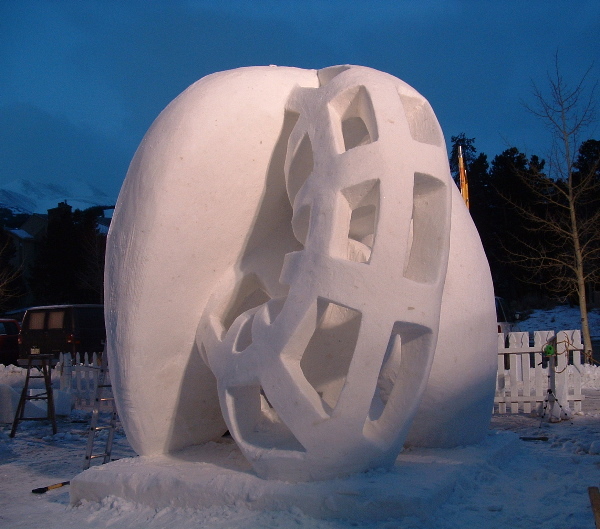 We sculpted a "Morin surface": the halfway point of the famous sphere eversion construction of B. Morin, interpreted by Carlo to be a pleasing size and shape for snow sculpture. We used a lattice structure to convey the inside of the snowball, and solid for the outside. The final surface we carved was a reasonable facsimile of the infinitely thin, self-intersecting surface. Carlo Sequin had made a sequence of laminated sheets showing the whole eversion process and that helped us explain the complicated twisting to the public. There were very many good sculptures this year, and we were pleased to be one of the two teams to receive an honorable mention (for "Most Ambitious Piece"). A K Peters, Ltd. "Turning a Sphere Inside Out"